Manson/Olson. Is this simple NLP word association? Is the Manson/Olson imagery similar by design – or a big coincidence? 9/11 is the primary reason this site exists. 9/11 is the primary reason radio.fakeologist.com… and radioarchives.fakeologist.com… exists. When I see a reference to 9/11 in a place that it doesn’t belong or doesn’t readily make sense, I puzzle over it. They use any excuse to bring up 9/11. It’s used for trauma based mind control. Serial killers have been questioned on this site. Why is it that they have gone out of fashion? Have we medicated the evil streaks out of men? Or is it more likely they were the psyop of the decades back in the 65s to early 80s? Like all writing styles, I suppose they go in out of vogue. Canada has had two big serial killer stories. Clifford Olson and Paul Bernardo. While perusing Clifford Olson’s wickedpedia page, I noticed a reference to 9/11 that I remember from the past but made little of it. Now often on multiple choice questions, you have 4 answers. One if correct, one is almost correct, one is wrong, and one is ridiculous. Clearly, the 9/11 reference is ridiculous. So why, if the entire Olson story is a hoax, put it in? I imagine it’s the ultimate “tag” for those in the know. It’s the ridiculous clue that is the proverbial slap in the face to the targets of the hoax, you. I’m convinced 9/11 was a hoax. I’m iffy on the serial killer psyops, but as I investigate, the stench of psyOp sewage increases as I look at the occult numbers and other unexplained anomalies. It may be a stretch to simply assume most or all serial killers are psyOps based on these simple tags, but perhaps they make far more sense when reviewing the bizarre and ridiculous storylines that occur around these equally bizarre characters. I’ll keep looking through these fakeologists lenses at these superstar media crime stories. You should too. Comment if you find anything. Let’s blow the lid off on the supercriminal stories. 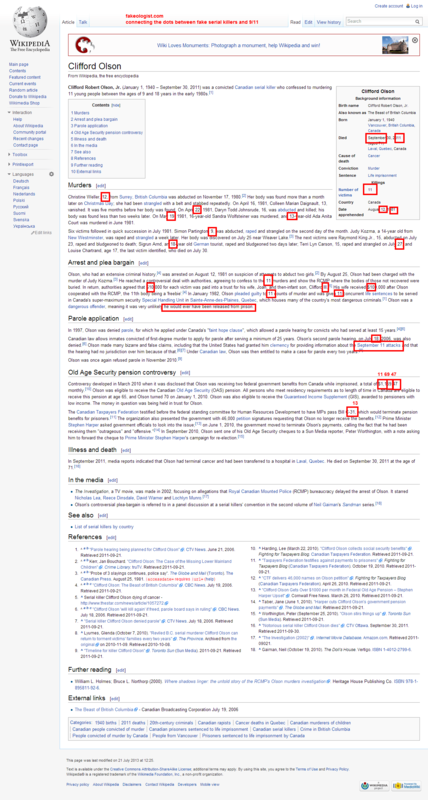 Clifford Olson – Wikipedia, the free encyclopedia. This entry was posted in Fearmongering, Magic numbers, Psyops and tagged charlie manson, clifford olson, serial killer on September 30, 2013 by ab. When will it end? When will the gig be up for NASA? Is it possible the world will catch on? If they can dream, then so can fakeologists. Twitter / NASA: Happy Birthday to us! NASA …. 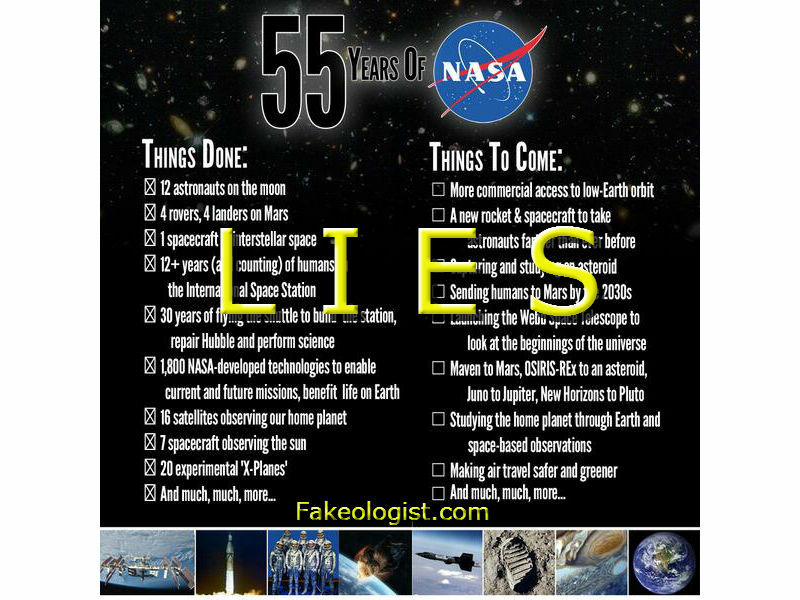 This entry was posted in NASA hoaxes on September 30, 2013 by ab. More proof that the Syria gov’t, and its opposition, are fully on the NWO payroll. When they start referencing the fake event known as 9/11, and the fake gassings, we know that they are reading from the worldwide script. All worldwide governments are on the same payroll at this point, and any perceived opposition to the West and its ways are completely scripted. I’m not convinced any government is truly grassroots. Syria’s foreign minister on Monday compared what he described as an invasion of foreign terrorists across his country to the Sept. 11, 2001, attacks on the United States. In a speech to the annual meeting of the UN General Assembly in New York, Syrian Foreign Minister Walid al-Moualem also said that “terrorists from more than 83 countries are engaged in the killing of our people and our army under the appeal of global Takfiri jihad. via At UN, Syrian FM compares country’s civil war to 9/11 – Middle East Israel News | Haaretz. This entry was posted in 9/11, Magic numbers on September 30, 2013 by ab. Does this head fit the body? Haven’t really examined this old story, but at first glance it appears that the head/face of this photo doesn’t match the size of the body. In other words, it looks out of proportion. Opinions? Is this a photoshop error or a real picture? Case of Quebec doctor who killed his kids, then walked free, returns to court | National Post. It appears this case triggered a new law, which automatically flags it as suspicious. In February, the government tabled the Not Criminally Responsible Act. The bill would give the court new powers to create a new high-risk category that would hold mentally ill offenders longer, without a formal review, and make it far more difficult for them to leave psychiatric facilities. This entry was posted in Suspicious media events on September 30, 2013 by ab. Grab a coffee, talk about the morning’s fake story. Seems to be a regular routine. This didn’t go national, as it appears no one died. Was there a drill planned for this morning by any chance? More than 30 people were injured Monday morning after two trains running on the Chicago Transit Authority’s Blue Line tracks collided, CTA officials confirmed. The accident happened just before 8 a.m. at Harlem Avenue and Interstate 290 in the Forest Park branch. A westbound train was struck by an eastbound train heading toward the Loop, officials said. Forest Park is a northwest suburb that surrounds much of O’Hare International Airport. Blue Line service between Forest Park and Austin was suspended due to the incident, CTA officials said. Shuttle buses were in place and inbound trains were moving normally. CTA officials said 33 people were injured in total and nine of them transported to area hospitals. via 33 Injured After 2 CTA Trains Collide | NBC Chicago. Don’t think this is big enough to put in the histogram.fakeologist.com… spreadsheet. Perhaps we need a sub-sheet for these little piddly ones. We may even need a sub-sub one for transportation. This entry was posted in Magic numbers, Media Hoaxes on September 30, 2013 by ab. Lie Witness News – Coachella 2013 – YouTube. of course, these “street people” are just as likely to be staged as well. This entry was posted in Cluesforum/September Clues, Recommendations, Video on September 30, 2013 by ab. A little fear and a lot of money in this government scam, complete with many occult numbers. via $1.3B medical marijuana free market coming to Canada – Canada – CBC News. In summary, the government, bankers, and security firms make their money, while the private guy can’t grow a week on his own (private) property. They’ve figured out how to tax air (C02), but they can’t figure out how to get their share of weeds on your property. I don’t think our controllers could have made their hand more obvious about what it’s all about. This entry was posted in Health, Magic numbers on September 30, 2013 by ab.